Jones, who had been much involved in the Great Exibition designed several structures on similar principles later in the 1850s. This one was "the most architecturally adventurous" (Dobraszczyk 187). [Commentary continues below]. 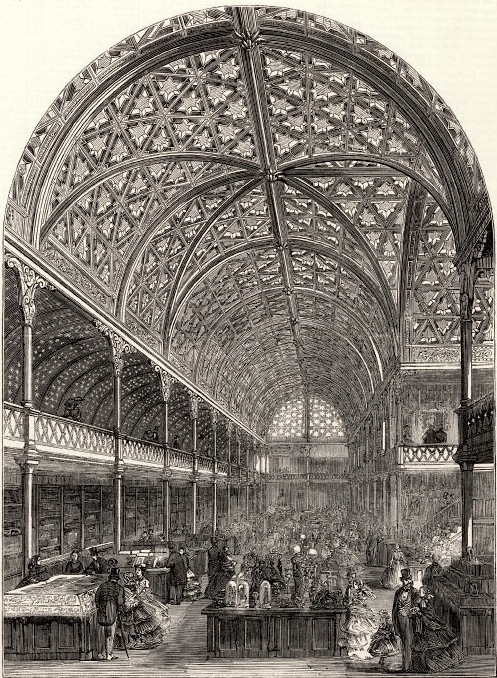 Here, as in his St James's Hall nearby on Regent Street and Piccadilly (opened 1858 and demolished 1905), he used iron and glass to great effect, and, with free rein for his interior design ideas, "abandoned the simplicity of the Great Exhibition scheme in favour of more complex polychromatic decorations featuring mirrors, coloured glass, and stencilled motifs derived from plant forms" (Shaddick 667). Colours and gilding were used to maximum effect, and the new glittering light-filled space changed people's expectations and influenced the way urban arcades were designed in the following decades (see Dobraszczyk 189). Shaddick, Nicholas. "Owen Jones 1809-1874." Encyclopedia of Interior Design. New ed. Ed. Joanna Banham. London: Routledge, 2015. 665-68.